SAN RAFAEL, CA Feb. 18, 2016 – A good recipe is composed of crucial ingredients that work in union to produce a quality product. Much like a good recipe, the Fourakis family works together to drive Glyká-Sweets like butter, eggs, flour, and even grape molasses drive its line of traditional Greek cookies and pastries. 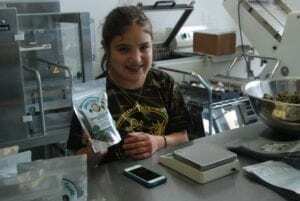 Utilizing their diverse individual talents and strengths the Fourakis family works as their own unique recipe to manage the challenges of starting a new business. As a result they’ve taken cookies from the family Easter party, and placed them on the shelves of grocery stores around the Bay Area. At Glyká-Sweets this holds true, not only for its line of traditional Greek cookies and pastries, but also for the people who make it, and who’ve made it possible. Starting at the top, where ladies always go first, owner and baker Effie Fourakis has mastered her line of traditional Greek pastries and cookies. Without her long hours of baking experimentation and persistence, there would be no product, no line of desserts, and no business. Not to mention the other things she does for the family on a regular basis as a registered Greek supermom. Baklavá trays cooked at two in the morning and twelve plus hour days rising and baking the New Year’s and Easter traditional sweet yeast breads Vasilópita and Tsouréki, are just some of the norms at Glyká-Sweets as they navigate a highly seasonal industry. It is not easy to start a new business while supporting a family, however, this is not the family’s first business. Vasilis Fourakis started their first business in the same year that he and Effie started their family. California Space Organizers has been in business for twenty-six years, the same age as their oldest son Achilleas. CALSO for short, specializes in custom closets and cabinetry to fit any space and has been in the San Francisco high-rise condominium market for ten plus years. Vasilis used skills he acquired in painting and construction and found a niche market to enter. Now he is the number one buyer of three-quarter inch melamine laminate in the Bay Area. CALSO is also the number one reason that the Fourakis family was able to have the flexibility to start another business, and have their own facility. 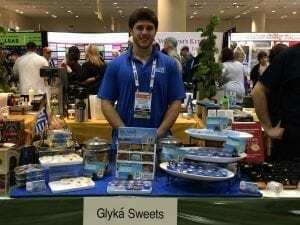 The first born of three, Achilleas Fourakis, works as the sales and marketing manager for Glyká-Sweets and manages relations with stores, takes orders, makes deliveries, and also is a baker-in-training. For Effie, having Achilleas in the bakery everyday is key to smooth operations. Those fifty-pound bags of flour and sugar aren’t going to lift themselves. Having a built-in salesman take over all of these responsibilities made things much easier for Effie, as she was able to focus on her baking and her nationwide online orders. Odysseas Fourakis, their second son, has just started at College of Marin, a junior college in Marin County, and plans to turn his love for machines into studies of mechanical engineering. Over the last two years he has been designing, developing, and building his own cookie-scoring machine for our Paximádia (biscotti type cookies). The CNC (Computer Numerical Control) governs the blade as it moves back and forth, and up and down scoring the loaf of dough. Adamant about fixing things, with a systematic approach and an eye for spotting problems, if the machines or ovens at Glyká-Sweets are ever down, it’s never for very long. Last but definitely not least, the baby of the family, Elektra Fourakis probably has the most unique story of all. She was born with a life-threatening heart defect that required open-heart surgery at just three months old. Battling a persistent set of health problems, Elektra has faced many challenges during her young life. In addition to the congenital heart defect that eventually required a second open-heart surgery at age twelve, she is hard of hearing and wears hearing aids. Most recently over the past two years, she has had seven procedures and hospitalizations for a narrowing of her trachea. In order to give back to the Pediatric Cardiac Care Unit at UCSF, and to its patients, she also makes and donates fleece blankets to the hospital. With a firecracker like personality you would never think that she had suffered through all these hardships, and dealt with limited mobility and physical activity. 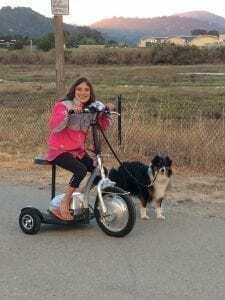 With help and love from her family, an electric scooter, and her hearing dog and best friend named Cleo, she is ready to tackle any task, even starting her own line of all-natural dog treats. While Elektra enjoys eating Greek sweets, her passion is baking for her canine friends. With help from the whole family, the Elektra’s Dog Treats line features eight flavors and supplies treats to eleven pet stores in the Bay Area (www.elektrasdogtreats.com). Currently a junior in high school, Elektra plans to go on to study business, and continue as a young entrepreneur. This recipe is the true key behind the full operations of Glyká-Sweets. Alone, each family member has strengths and weaknesses, but together they form an interwoven network of knowledge, skills, and most importantly charisma. A ‘refuse to lose’ attitude has watered the seed of an idea, into the sapling of a start-up business, and they hope that it will grow tall and wide as it settles itself amongst the canopy of the marketplace.